What we do isn’t like “normal” fishing. It’s about the challenge and the story behind chasing the catch of a lifetime. There is a real sense of personal achievement amongst spearfishermen when they land that fish. It just makes the pictures even more precious. Before the avalanche of modern technology, pictures were simply framed and stuck on the wall. Now, with the advent of digital cameras and social media, the wall in your living room isn’t as interesting as the wall on your Facebook profile. Digital cameras and cellphones have now replaced cellulose film almost completely. It is now super easy to take pictures, but it still takes skill and a keen eye to get good ones. The advent of the GoPro and Intova type video cameras have opened up underwater videography to the average guy. Previously, only the wealthy and exclusive divers had the privilege to film their underwater adventures, but now filming your dive and posting it on the web is commonplace. Some of the most mind blowing dives are filmed by the average guy in the street. In this case though, the term easier said than done, truly does apply. Even if you have all the right gear, it is very frustrating to get back from a dive and realise that you didn’t capture the magic you just experienced. Behind the Lens is a series dedicated to helping you nail the perfect picture and videos of your most epic dives and prized catches. At USM, we acknowledge that there are guys out there who are just better at getting the shot than we are, so we got the best, to help us help you! This series will kick off with articles aimed at filming dives with mini action cameras. There is probably no better person to educate you on how to use these best than Richard “Snoek” Leonard. He is the director and cinematographer of the One Fish DVD’s, the brain behind the popular Top Shots YouTube series and a host of other brilliant spearfishing productions. Richard deals with the top, international spearfishing videographers on a weekly basis and truly knows what works and what doesn’t. Because of the complex nature of filming, I am sure you will have a host of extra questions and comments. We have opened a special new thread on our website forum for these discussions. Make sure that you check this out for more information and discussions about getting that perfect. I thought I would pay my respects to Nick and maybe inspire all the average guys (like myself) out there, by including a write up that I found online. It shares a brief understanding of the history and motivation that resulted in Nick inventing his awesome camera, the GoPro. Now at this point you might be thinking that this article is an advert for GoPro. Let me say that this is not my intention. I truly am blown away with the camera and thankful for its invention. I agree, it’s not perfect… but before the GoPro arrived on the scene it was very expensive and quite difficult to capture the varying, and often chaotic, dynamics of our amazing sport on film. The GoPro has opened up a whole new world for us in that the average spearo is now able to capture his hunt on camera and easily share it with the globe via the Internet. And for this we should be super stoked! In part 2 of this article, I want to focus specifically on the most popular way in which spearo’s are filming today: the gun mount. In my next article I will cover the head mount, but for now I want to talk about the technique of filming using a gun mounted camera. I believe that this technique is the most popular because it’s the easiest and least cumbersome way to get some super cool spearfishing footage. By using the gun mount, a spearo can film and at the same time not be distracted from the hunt. The hunt itself is super challenging, so to add in a second dynamic of intentionally trying to film your shot whilst trying to nail a fish is often a risk that most spearo’s are not willing to take. I find guys consistently get the most important and exciting part of the hunt on camera using a gun mount.You all know that moment when the fish comes in: you line up and bam! you shoot. For us at ITZTV we will almost never display footage of a fish being taken unless we have the footage of the actual shot. Let’s be honest, it’s just not as fun to watch a spearo dive, and then all of a sudden appear in the very next scene fighting and landing the fish. It’s like the most important and intense moment of the whole experience is missing (and those “swim to the camera and shoot over the cameraman’s head” fake shots don’t quite cut it for me.) Framing your shot with a gun-mounted lens is so easy. Pretty much all you have to do is remember to put the camera on and press record, the camera and your gun do the rest. This is very helpful in rough conditions or when you have to dive deep and can’t lug a camera down there with you. And as I mentioned before, you feel almost no irritation whilst filming – it is almost as if there is no camera with you. There will always be a fixed speargun smack bang in the middle of the frame. Well, not always in the middle but you know what I mean. 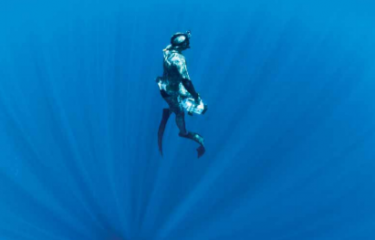 In my opinion the best way to film spearfishing is to try and imitate what the spearo himself sees and allow the viewer to experience the hunt as if he or she were there shooting that fish themselves. When you are hunting, your gun is often moving in different directions. Sometimes you don’t see your gun at all – just the fish – and then other times it’s right in front of you. When the time is right, you move your gun into position and then take your shot. 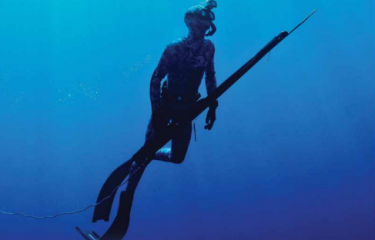 To see a fixed gun in the frame that does not change position is quite unnatural and definitely ‘second prize’ with regards to great spearfishing cinematography, as far as I’m concerned. This technique also becomes quite distracting when you are filming something amazing out there, like rays, whale sharks, dolphins and so on. To see a gun pointed at these animals in your footage is not cool. And of course, when you film your friend landing his fish, you end up having to point your gun at him… DODGY! The recoil can also spoil the footage. 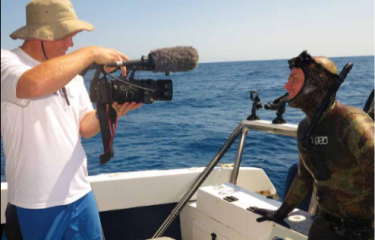 The art of filming a great spearfishing sequence is not just in the perfect execution of filming the fish being shot, it is also in the way you film the response of the fish on impact. The way you film the fish screaming off into the blue, into a hole or just rolling over is key to the viewer experiencing the intensity of the fight that is to come. This is what you see as the spearo after the shot and what your viewer should see as well, but the recoil can often ruin the moment directly after the shot. The gun mount also makes it almost impossible to film the fight and landing of a big fish. Firstly, let’s cover some basic action cam management before we get to the gun mount action. As I said in the first part of this article (see USM vol. 15), do your camera prep the night before. I work on a 4-point check-list to make sure everything is perfect and ready to go on the day of the dive. Back up and then reformat your SD card. Clean your camera lens. I am pedantic about cleaning my camera lens perfectly. You won’t believe how many times I take my friend’s camera out of its housing to find fingerprint smudges all over the camera lens! An action cam’s lens is very small as it is, so to decrease its light reception even more will seriously impact the quality of your footage. The same goes for your bigger camera’s housing lens. The amount of great footage I have seen ruined because of an irritating black piece of dirt or something in the middle of the frame makes me so upset. And finally, in the case of the gun mount, make sure that it is 100% fastened and sturdy on your gun. So battery charged, SD card reformatted, camera lens cleaned and housing lens cleaned. Now you are ready to film. The next important point in action cam management is to always keep your camera in a shaded spot on the boat. If you leave your camera in the sun and then jump into the cool water with it, condensation takes place inside your camera housing. Condensation is the process where water collects as droplets on a cold surface when humid air is in contact with it. Unfortunately this happens inside your housing, which causes your camera housing to mist up inside. This can take 10 to 15 minutes in the water to clear. By this time you might have already finished your drift or shot that one fish and the footage is now ruined by the infamous black spot or misty circle that so many of us have seen. When you get back on the boat, remember to put your gun and camera back into that shady spot and avoid the issue altogether. A spare battery costs so little, especially when you consider that not having a spare means missing out on capturing that fish of a lifetime for you to relive over and over again on film. Now onto the gun mount. To me the gun mount positioning is vital. Some guys position their gun mount at the very back of the gun. This is good with regards to the reduced impact that the gun’s recoil has on the footage. The downside is that action cams have a very wide, fish eye lens, so placing the camera right at the back of the gun often results in the fish looking a lot smaller than it really is. The other downside of this position is that there will always be a gun smack in the middle of your screen, blocking the viewer’s ability to see the fish in plain and uninterrupted sight. Some guys like to place the gun mount right at the front of the gun just before the nozzle. This is great in that it brings the fish very close to the camera. But, it feels quite unnatural for me to only see a spear and no speargun in view at all. My perfect set up is 4 to 5 inches from the front of the gun. This way, the camera is still quite close to the fish but you get to see part of the speargun, making you feel like you are viewing the hunt through the eyes of the spearo. I believe that filming the rest of the hunt, after the shot, is of vital importance for the viewer to enjoy the whole experience. As I mentioned earlier, it is important not just to film the shot but also the way the fish responds to the shot. It is as important to film the fighting, landing and the grand finale:the display of your catch. We must see that final moment of victory with you holding up your fish with pride for all to see. Trying to achieve this with a gun mount can prove to be quite difficult, although I have seen some guys manage it pretty well. An important thing to learn, if you are using a reel gun, is to shift your thinking and attention not only to fighting the fish, but to filming the fish and all the action thereafter. 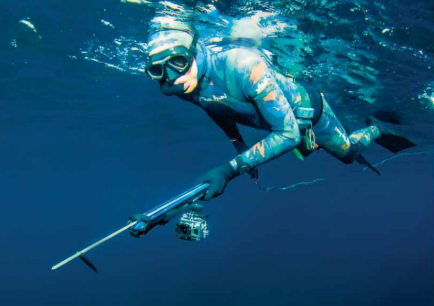 You now need to think of your speargun as a tripod or rather a monopod. Use your gun to point the camera as steadily as possible at the fish for as long as you can until you reach the surface. You then probably need to start pulling on your line. Even so, I have seen guys fighting a fish while making sure the camera is facing in the right direction, so as to capture all the action on camera. Of course all depends on the fish you have shot. You probably aren’t going to follow this procedure when you shoot a 30kg Wahoo or a Marlin. In that case, hahaha, good luck trying to self-film anything from the gunshot onwards! Once you have landed your fish it is important to finalise the moment, no matter what camera set up you have, by showing a good clip of you holding up your fish in or out of the water – preferably with the spear still in the fish and in the water. This is really hard to do by yourself with a normal gun mount set up. If you have absolutely no other choice, then make sure to keep your gun mounted camera level with yourself and the fish. If you point the camera even slightly upwards at yourself you will normally get what’s called back lighting: you and your fish will be in shadow and look dark in colour. The lower your camera is and the more ‘upward’ you film this shot, the darker you will become… even to the point of being a complete silhouette. Rather dive down with your gun and camera and then film this shot slightly (just slightly) downwards, allowing yourself and the fish to be fully lit up. An even easier way to do this is to call your dive buddy over, give him the gun and camera and get him to film a couple takes of you landing the fish and then showing the fish off to the camera. The best way of all would be to remove your camera from the gun mount and then give the camera to your dive buddy to film all the action or just the landing and display of your fish. This ensures that you capture all of the key components of the hunt on camera for everyone to enjoy. Last but not least…it’s super cool to go spearfishing with someone who shares your passion for cinematography, a dive buddy that is on the same page as you and is just as keen to get great footage no matter what the camera set up or sacrifice might be. By working together towards a common goal, the job is made much easier. Chris Coates and I operated like this in the movie One Fish and it worked really well. Now we have moved onto working with dedicated cameramen… but that’s another story for another article. Next time I’ll be talking about using a head mount and the hand held set ups. So until then… happy hunting, safe diving and good luck in taking your spearfishing cinematography to the next level!